This Professional Distance Meter adopts laser technology to measure distance, area and volume accurately, quickly and conveniently. In addition, this meter can measure distances or height indirectly base on Pythagorean Theorem when direct measurement is not feasible. GMT Q70 Laser Distance Meter is a premium quality Distance Meters from GMT. Moglix is a well-known ecommerce platform for qualitative range of Distance Meters. 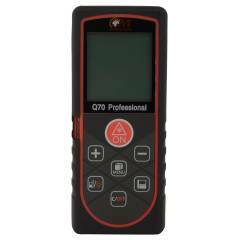 All GMT Q70 Laser Distance Meter are manufactured by using quality assured material and advanced techniques, which make them up to the standard in this highly challenging field. The materials utilized to manufacture GMT Q70 Laser Distance Meter, are sourced from the most reliable and official Distance Meters vendors, chosen after performing detailed market surveys. Thus, GMT products are widely acknowledged in the market for their high quality. We are dedicatedly involved in providing an excellent quality array of GMT Distance Meters.